Soup is water which boiled together with other ingredients such as vegetables, meat and melons, until the flavour is extracted. Soup offers high nutrition values enriched by the ingredients we have added in the soup. Besides pork ribs, I used a variety of vegetables in this recipe. I think this is one of my successful soup recipes, much likeable by my family. This soup gives off aromatic smell while boiling it, and most importantly, this soup has its natural sweetness. It has very pleasant aroma and taste to your palate. Nutrition experts said it is best to consume 3 or more colours of vegetables and fruits in a day in order to suffice the intake of nutrients which required by our body. 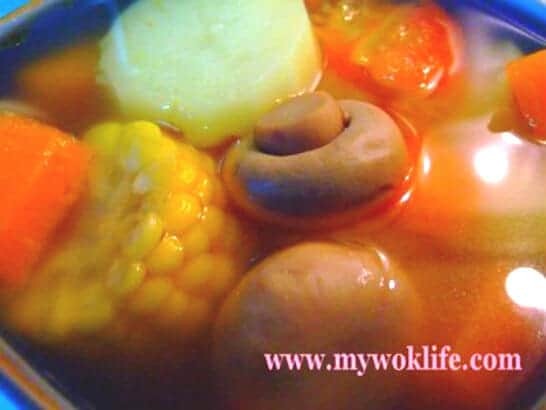 A balance dietary soup where Vitamin A (mainly from carrot), Carotene and Anti-oxidant (from tomato), Iron and Magnesium (Corn), Potassium (mainly from potato) and other minerals (calcium, selenium, copper) and vitamins (Vitamin C and B6), are found in these colourful vegetables. That’s the reason it is called as ABC soup, meaning it has all the Vitamins A, B and C! This soup benefits not just the dieting adult, but the children, too. Children need extra Vitamin A to grow strong as well as for better skin and eyes (about 2000 – 3500 IU per day for aged 3 – 10). Most children wouldn’t mind eating the carrots from soup since they are tender and taste with natural sweetness. So as the soup, too. All soups can be served as 1-dish meal, in fact. Most of the time, the soup has both meat and vegetables in it. Just serve with a bowl of steamed rice, and you will have a light and nutritious meal as dinner/ lunch. I like to have the soup as beverage replacement during meal instead. Have this soup cooked with 1-2-3 steps, in 1 hour time! 2 regular carrots, cut into medium pieces lengthwise, and halves each piece if too thick, especially the beginning part. 1) Heat up a pot, add oil. Sauté onion till fragrant. Quickly pour in water and bring to a boil over high heat. 2) Add blanched pork ribs, mushrooms and all vegetables, except for tomato. 3) Reduce heat to low fire. Covered with lid. Simmer for 1 hour, or longer, if desired. Add tomato and sprinkle salt to taste, 5 min before heat off. Serve hot. It’s relatively low calories, too. This soup counts 170 kcal for a large bowl. Tips: If you do soak your carrot and corn in water to clean, do not soak for too long, maximum 15 min. *Add fresh tomato to your soup gives you a refreshing taste. It has high anti-oxidant properties, too. Just drop by to say thanks for the recipe. Mum’s version is abit different and her soup is more cloudy. She adds dried red dates and “yok chok” without the corn and mushroom. I tried cooking this last weekend and everyone loved it esp my bf! Thanks so much, I secretly love your version better! hahaha…Happy blogging! To hear one tried and likes my recipes is the greatest achievement for me to blog and share my recipes. I had pork ribs sitting in my freezer and since it is a Sunday, I was making plans to cook them. I scoured the web for some good soup recipe since it is cold nowadays, I found yours really nice. So off I was to the market to buy the veggies. I just wanted you to know, the soup dish was a HIT! and very original too. thank you!